Image: Nicholas von Hoffman in 1972. “I sincerely believe in what I write, and I get a kick out of getting those Washington mossbacks angry,” he said. Credit George Tames/The New York Times. Nicholas von Hoffman, a provocative author, broadcast commentator and syndicated columnist who examined American politics and culture for five decades from a left-wing perspective, died on Thursday in Rockport, Me. He was 88. His son Alexander said the cause was kidney failure. Mr. von Hoffman, who died in a health center in Rockport, lived in Tenants Harbor, Me. In a journalistic métier of mingled fact, opinion and literary devices, Mr. von Hoffman wrote for The Washington Post from 1966 to 1976, contributed to major magazines, aired his views on national television and radio and wrote more than a dozen books, including “Citizen Cohn” (1988), a best-selling biography of Roy M. Cohn, the chief counsel to Senator Joseph R. McCarthy in his 1950s anti-communist crusades. Mr. von Hoffman, who never attended college, styled himself a “creative troublemaker” after his mentor, the social activist Saul Alinsky, for whom he worked as a community organizer in Chicago before starting his journalism career at The Chicago Sun-Times in 1963. Mr. von Hoffman proved to be a superb reporter and writer, covering civil rights in the South with vivid accounts of protests and racial violence. Once hired by The Post, he did not fit into regular news beats. But given the latitude of a column, he became Washington’s enfant terrible, attacking the Nixon administration over the war in Vietnam, violent police crackdowns on protesters at the 1968 Democratic National Convention in Chicago, and President Richard M. Nixon’s taped Oval Office profanities as the Watergate scandal closed in, forcing his resignation in 1974. Mr. Hoffman sounded the political death knell with a bitter irony. He provoked more outraged letters to the editor than any writer in memory at The Post, said Chalmers M. Roberts, a longtime correspondent. 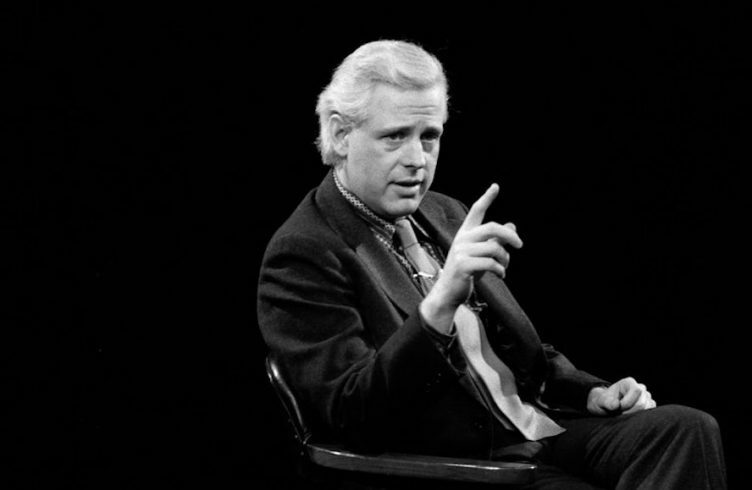 In 1970, Mr. von Hoffman raised a storm of protest with a column that referred to American prisoners of war in Vietnam as a political issue involving “just 1,500 men.” Angry letters from prisoners’ families and support groups flooded in; many were published, along with a Post editorial disagreeing with the column but defending the author’s right to his opinion. Mr. von Hoffman, a thickset man, sometimes let his prematurely gray hair get a bit long. But he hardly looked the part of a radical. He wore spectacles, dressed casually in sports jackets and jeans, smoked a pipe and looked cool, smiling and relaxed, even when caught up in a dispute on national television. 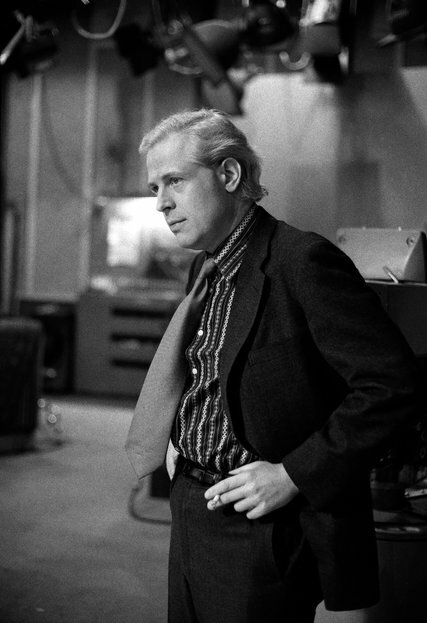 Nicholas von Hoffman was born in New York City on Oct. 16, 1929, to Carl von Hoffman and the former Anna Bruenn. His father was an immigrant Russian cavalry officer. After graduating from Fordham Preparatory School in the Bronx in 1948, Nicholas went to Chicago, intending to enroll at Loyola University. Instead, he took a research job at the University of Chicago, and in 1954 joined Mr. Alinsky as a field organizer in black and Hispanic communities on the South Side. His marriage to Ann C. Byrne in 1950 ended in divorce in 1968. She was also a social activist in Chicago and was later a dean at the University of Rhode Island. She died in 2015. Besides Alexander, Mr. von Hoffman is survived by two other sons from his first marriage, Constantine and Aristo, and two grandchildren. A second marriage, to Patricia Bennett, also ended in divorce. Mr. von Hoffman’s first book, “Mississippi Notebook” (1964), grew out of his civil rights coverage for The Sun-Times. Early on at The Post, on the education beat, he wrote a book, “Multiversity” (1966). In cultural affairs, he explored San Francisco’s hippie drug scene and wrote another book, “We Are the People Our Parents Warned Us Against” (1968). Finally given latitude as a columnist, he hit his stride. At the 1969 trial of the Chicago Eight , the leftist radicals charged with inciting to riot at the Democratic National Convention the previous summer (they became the Chicago Seven after one defendant’s trial was severed), he depicted a theatrical parody of jurisprudence. Reporters for other news organizations could not convey Mr. von Hoffman’s absurdist view of the trial. “He has caught its tone and flavor in a way that has been almost impossible for those of us operating under tighter editorial restrictions,” said J. Anthony Lukas of The New York Times. But even the more objective reporters found rare spectacles to write about: The Black Panther Party activist Bobby Seale, whose case was severed, called the judge “a fascist dog,” “a honky” and “a pig.” When he refused to be silenced, the judge ordered him bound and gagged in court. Two defendants, Mr. Rubin and Mr. Hoffman, appeared in court wearing judicial robes. They complied with an order to remove them, revealing Chicago police uniforms underneath. After leaving The Post, Mr. Hoffman wrote syndicated freelance columns for King Features for decades. He also wrote book reviews and magazine articles for The Times and contributed to The New Republic, Esquire, Vogue, The Nation, Harper’s, The New York Review of Books and other publications. He collaborated with the Doonesbury political cartoonist, Garry B. Trudeau, on two books, “The Fireside Watergate” (1973) and “Tales From the Margaret Mead Taproom” (1976). He also wrote two novels, “Two, Three, Many More” (1969), on the campus disruptions of the 1960s, and “Organized Crimes” (1984), about gangland Chicago in the Great Depression. His most successful book was “Citizen Cohn,” which was on The Times’ best-seller lists for eight weeks in 1988 and inspired a 1992 movie of the same title starring James Woods. 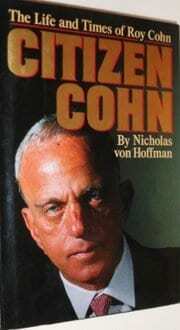 Christopher Lehmann-Haupt, in a review for The Times, called the biography a “richer, more rounded, better balanced view” than Sidney Zion’s contemporaneous book, “The Autobiography of Roy Cohn,” based on interviews with Mr. Cohn, who died in 1986. Mr. von Hoffman broadcast 250 commentaries on public affairs in the 1980s for the syndicated Cato Institute radio program “Byline.” From 1993 to 2008, he wrote columns for the weekly newspaper The New York Observer, and from 1996 to 2007 he contributed to Architectural Digest. He also wrote for The Huffington Post, and composed the libretto for Deborah Drattell’s 2003 production of “Nicholas and Alexandra” by the Los Angeles Opera. Mr. von Hoffman also wrote “Hoax: Why Americans Are Suckered by White House Lies,” (2004), and “Radical: A Portrait of Saul Alinsky” (2010), based on his recollections of his years working as a community organizer with Mr. Alinsky. An earlier version of this obituary misspelled the surname of a former New York Times reporter. He was J. Anthony Lukas, not Lucas.